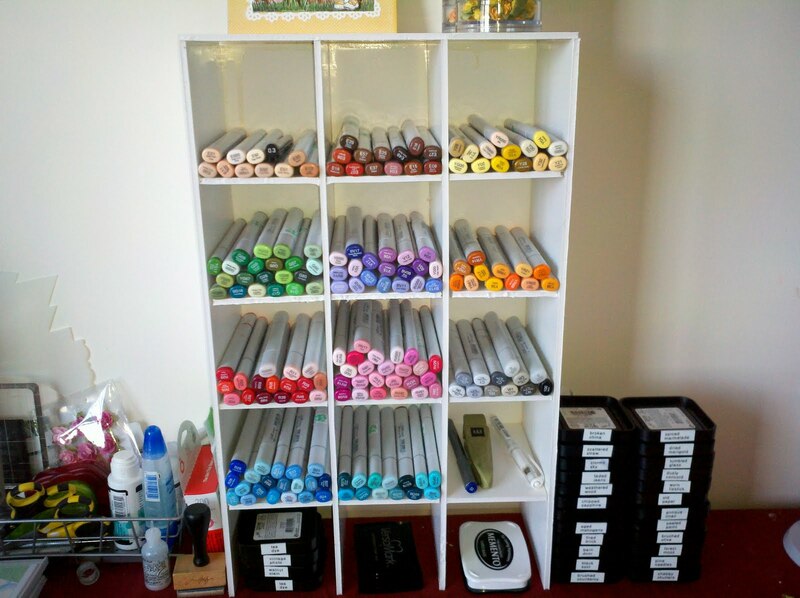 I also thought I'd share some new photos of the room that I'm using now as my craft room. I was in a huge room downstairs which was my scraproom. I haven't been able to scrap since I lost my daughter and being down there was too hard for me so I moved into one of the smaller guest rooms upstairs. 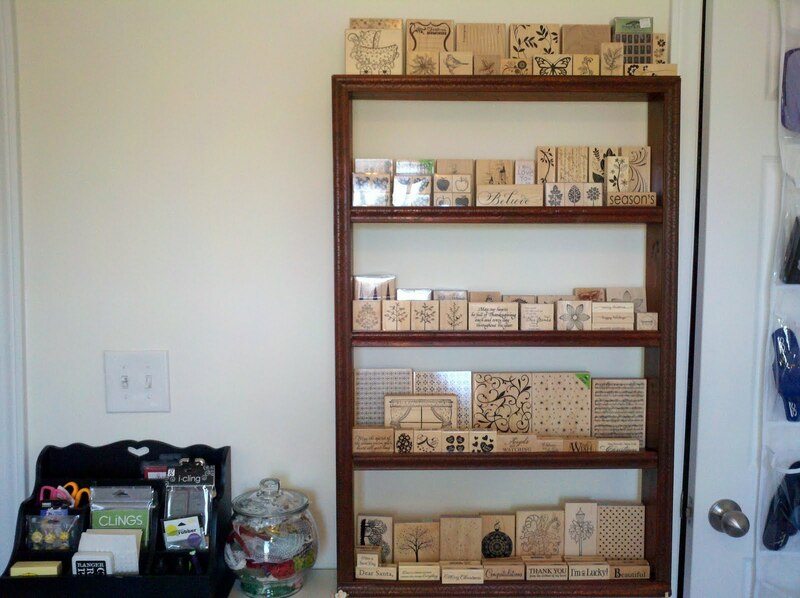 The stamp shelf was made by my husband for my birthday a couple of years ago. I love it but need another one. Hmmm...maybe I can get him to do another one this year as only my favorite wood stamps are on there. The rest are stored in drawers. 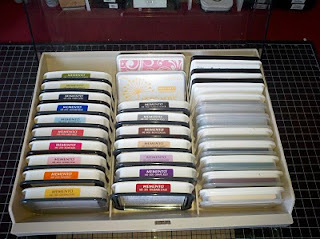 The case that holds my inks (mostly memento) is an old cassette case that I found at good will. It's the perfect size for my inks. The unit that is holding my coveted punches is from target. You buy the pieces separately and just stack. What you aren't seeing in the picture is that there is a total of 4 drawers under the shelves and they hold all my supplies. Oh and the little black thingie (not sure what to call that) is perfect because it's got a bunch of cubbieds that hold mostly new things that need to be put away. Sort of my catch all. It also has a slot in the back that holds 12x12 paper. Love that and I bought that at Hobby Lobby. LOVE the peek into your fun creative space!! I am so glad that you are able to share your talents again after your very very hard times in life. You have touched my heart..
Wow Julie..great job on your unit. They are really so easy to make aren't they. 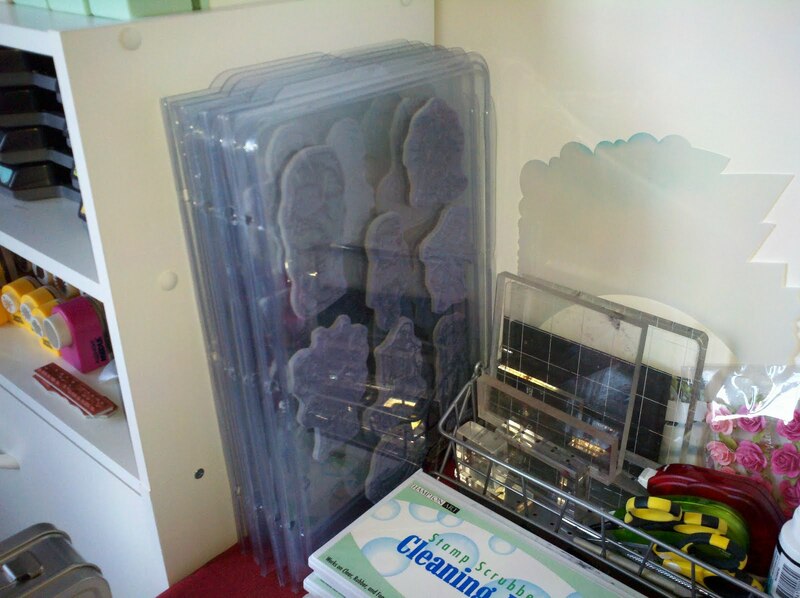 I love mine and made another unit today for inks, perfect pearls and stickles etc. And you are very welcome for the instructions, I am just so glad that I found the one on YouTube that I adapted and was able to pass it on. 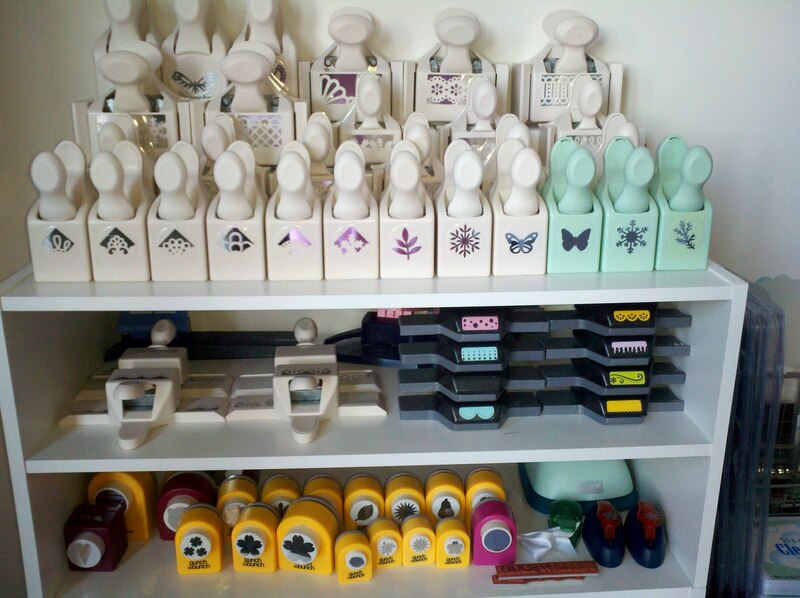 BTW I really love your punch and stamp shelves. Great job, everything looks so neat and organized. You can come help me anytime! 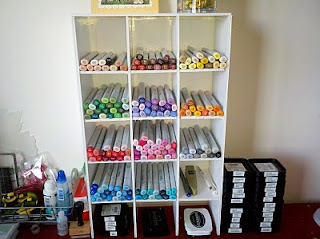 Great job making your Copic storage unit! I admire you. I agree that you have lots of great ideas for storage and they all work very well. You seem very organized. Glad you are back to stamping in your new room. sorry about your loss but the storage is awesome. I want to make one that will hold my ink pads. Very impressive organized craft room...you go girl! Hi Julie, It's me again sweetie... Just stopping by with a big thank you for stopping by today with your kind words. I tried to find an email for you and couldn't so I will leave the info here for you.. The checked papers that I used come from many different paper companies. I buy it in bulk.. LOL... some are Graphic 45, 7 Gypies Making Memories. and yes I LOVE LOVE LOVE Mary Engelbreit she is my hero artist..